High school volunteers are needed at St. Mark’s Day. Check out the slots below and email/text Molly to sign up. St. Mark CYM will be participating in Prayer & Action this year! P&A is a 6-day mission trip in the Wichita Diocese which begins on Sunday evening and concludes midday Friday. This is a unique opportunity to encounter the person of Jesus Christ through prayer and service to our neighbor alongside other youth of the diocese. Click the link below to sign up for the ministries at our next CYM Mass or email/text Molly. New volunteers are always welcome! Please consider getting involved and serving the parish community in this way. Join us downstairs every Wednesday night at 8pm for food, fun, and fellowship. Activities include trivia, competitions, movies, games, prayer, and more! 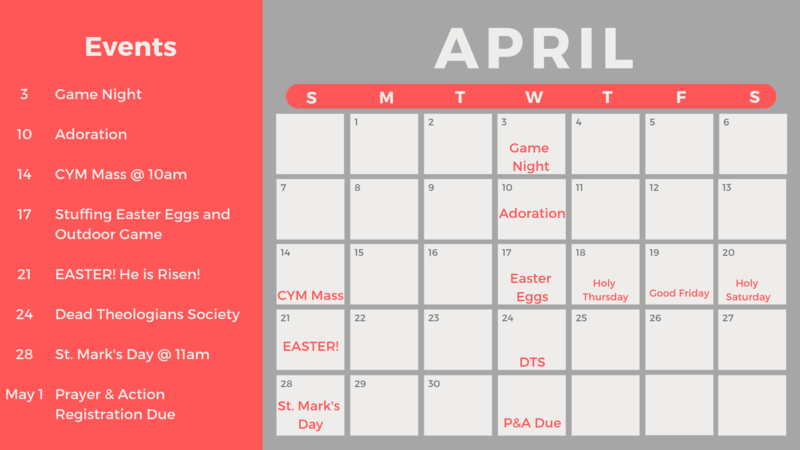 Check out the calendar for Wednesday night events and other great opportunities to get involved!